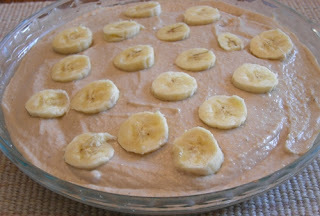 Additive-Free Eats: Banana Cream Pie - Oh my! Contrary to popular belief, Agave Nectar is not "all natural". In fact, it's a highly refined sweetener and "the end result [of its refining] contains as much as 90% fructose. Keep in mind that high fructose corn syrup with all its documented ill effects attributable to its fructose content is only 55% fructose". See: When Natural Foods Aren't Natural: Agave Nectar (This is not to imply that HFCS is any better for you!) Research has shown that fructose causes high elevation in blood sugar levels resulting in weight gain and the potential for diabetes, among other health benefits detriments. You can use it in the recipe if you choose, just wanted to share my 2 cents! Okay, okay.... on to the recipe! Place the almonds in a food processor and grind them. Add the coconut and process for a minute or so. Then add in the maple syrup, coconut oil, vanilla and salt. Process until everything is incorporated. Remove from bowl and press into the bottom and side of a 9 inch pie pan. Place in the freezer while you make the filling. Next, place the cashews and about 1/4 cup water in the food processor. Blend well, then slowly add in the lemon juice, coconut oil, maple syrup, vanilla, bananas and salt. Add a little more water, if you need to (I did not need to). Blend until very creamy. 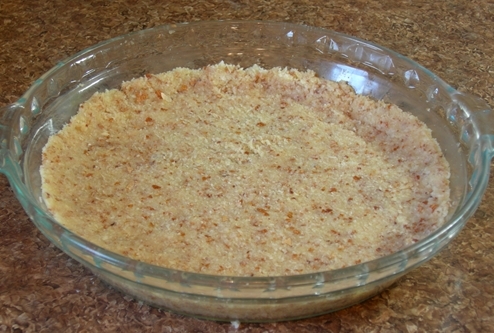 Remove the crust from the freezer and pour in about half of the filling. Scatter about half of the bananas on top, then the rest of the filling. Arrange the remaining bananas on top. Place in the freezer for a few hours, and leave at room temperature for at least an hour before serving. Store leftovers in the refrigerator, up to a few days. This sounds pretty amazing, I should give it a go - a change from banana muffins or a banana loaf. This looks DELISH! Thanks for sharing! I'm sooooooo going to try this one!! !